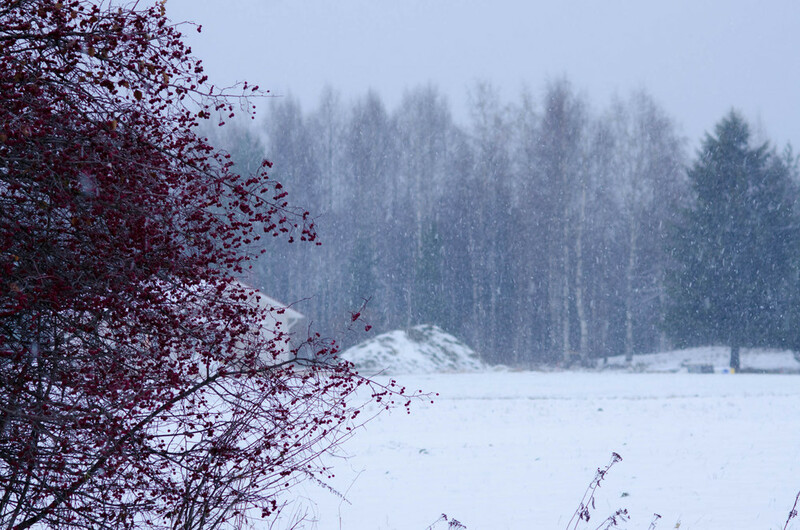 Greetings from the wintry climes of eastern Finland. OPOE has been in the small village of Selkie for just over a week now. It was clear and crisp when we arrived on Friday - with a few yellow leaves still on the trees - but the snows came quickly and then the temperature dropped. In short: it's been an icy and snowy, yet sunny and beautiful week in North Karelia. We've had a surprising welcome in the region. OPOE has received quite a bit of media attention, both in regional and national papers. We've been interviewed by two different reporters so far, and it seems a new article comes out daily about our project. Nuin-Tara and I are pictured here filming the salting of a moose skin. "They are the lungs of our earth," says Tero Mustonen, standing in the middle of the Vehkasuo marshmire, the cold wind blowing around him. "They are carbon sinks," he adds, gesturing at the frosty ground. The soft Marsh Labrador Tea gives deeply under our boots as we walk diagonally across one of the largest intact marshmires in the Jukajoki watershed. “[Marshmires] act as buffers or zones of mitigating climate impacts going on in the big climate and in the macro system in the northern part of the planet." Tero adds, "It's a good site for grouse, capercaillie, and crane." At first glance, the marshmire appears desolate; the wind blows steadily and cold, and a few small pine trees poke out here and there through the snow. But Tero’s practiced eye points out signs of life all around. We can see tracks of hare, fox, mouse, and a flock of grouse "talking", Tero said, pointing to large patterns of disturbed snow in the center of the marsh. The grouse have come to the center of the marshmire to congregate and eat lingonberries, which protrude red through the frosty snow. We even crossed paths with wolverine prints on our way back to the car. 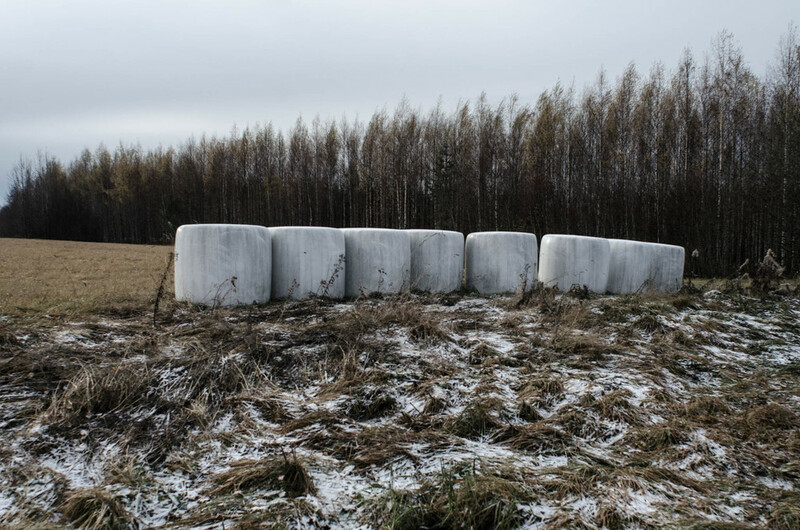 In addition to being carbon sinks, habitats for birds and animals, and sites for gathering berries and game by local residents, the marshmires are integral filters for Finland’s vast freshwater rivers and lakes. But since the 1950s, vast swaths of Finland’s forests and wetlands have been heavily logged; drained to create farmland; and trenched, dried and turned into peat fields to burn for fuel. In over 6 million hectares of Finland’s wetlands, these practices have created a blighted environment. In Jukajoki catchment area a special feature is the highly acidic discharges, where runoff from heavy rains flushes vast amounts of iron sulfide and organic sludge into the rivers, streams, and lakes. Tero explains that the project includes man-made wetland units, which will become real marshmires in 100 years or so. One pilot wetland unit just west of Lake Jukajarvi - on land donated by a villager - acts as a catchment for discharges from ditches and streams draining out from forestry and marsh areas above. The water coming out of this man-made wetland unit is already astonishingly clean and is a sign that these types of catchments can have lasting beneficial impacts to water quality and lake and stream health, in just a couple of years. OPOE is here because the Jukajoki river restoration project is a great example of how a relatively small, community-led project, can have long-lasting implications and impacts at the local and regional levels. This one project is a great example of a collaborative management approach to converting a highly environmentally damaged area back into healthy habitat for wildlife, hunters, forests, and of course, into future carbon sinks. The project is also a model approach to integrating local and traditional knowledge and scientific research and methods. In Selkie, we are the guests of a nationally recognized architect, Antero, and his wife - a professional artist and teacher - Seija, and their son Veikko. We are staying across from the main farmhouse in Seija’s wonderful art studio (I wish I had one just like it!) and guest cottage. Our room is warm and cozy, with the most comfortable bed I’ve slept in in years. 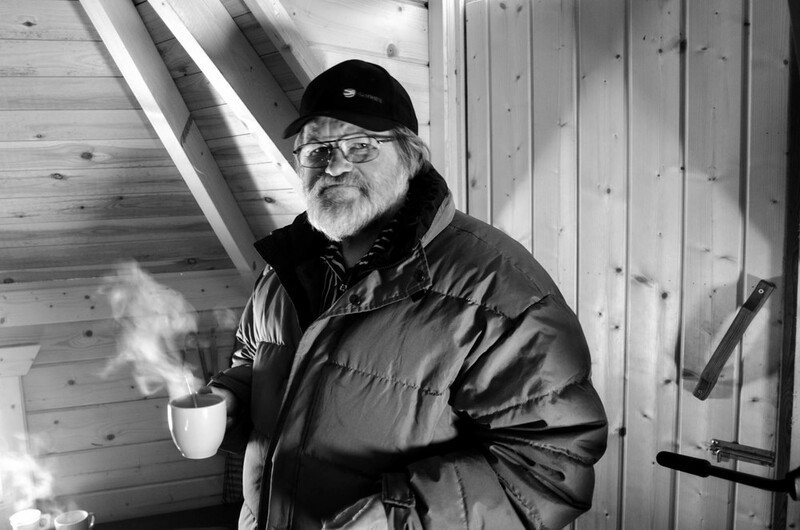 Antero and Seija regularly invite us over for tea and to chat, and let us use their internet and their sauna – an essential part of life in North Karelia, and a real treat after a long day filming in the cold. We couldn’t have asked for more and are very grateful for what they have provided. On Sunday we woke early and drove with Tero to a small octagonal hunter’s cabin, sitting in the darkness off a quiet road. A fire roared inside, and soon hunters began to congregate, talking and laughing around the fire and in the darkness outside. We shook hands all around and talked with the hunters, warmly dressed and sporting neon orange colors. One showed us his father’s gun, first used as a military rifle in the second world war. Holding it up for us to see, he said with a smile, “It has a long history behind him. First shooting the Russians, and after that, shooting the moose in North Karelia.” As the blue morning light began to appear, the hunters made their plans for the day. It was arranged that we would go with Tero and Petri, a local hunter and dog trainer. We followed Petri to his house where we picked up his hunting dogs and then headed out into the bush. For about an hour we watched as Petri dispatched his dogs into the forest. For Petri, the day was partly about sharing in the hunt, and partly about training the two younger dogs he brought along. The dogs would run into the bush, quickly and silently sniffing for moose, then return to Petri. He would send them off again and then track their progress through the forest on his phone app. Soon, Tero received a call that a moose had been shot and we bounced through the forest in Tero’s old Saab, on our way to find the hunters. After a short walk, we discovered a group of 5 hunters gathered in the forest around a young moose. A canoe-type stretcher arrived, and the moose was turned into it and drug quickly out of the forest. We then walked to a nearby field where another moose had been shot. This very large, full-grown male was also brought through the forest in the canoe-type sled to a small clearing where both moose were then loaded onto a truck and taken to the community slaughterhouse to be cleaned and butchered. Tero and OPOE hiked up the hill and took lunch sitting on a few frosty logs on the edge of a farmer’s field, then headed off to the slaughterhouse. For about an hour, we watched as the two moose were skinned and cleaned. There was a teenage boy there, as well as a teenage girl, who’s father had shot the moose. She had her gun license, but had not yet taken a shot at a moose. She was there to observe and learn, as was the boy, who’s job it was to spread the skin on the ground outside and then, by means of preservation, cover it with a layer of salt. The spirit was very communal, and I reflected on what Tero had told us earlier: “What makes this crucial for the village is that it’s a communal hunt. The use of land and the teams…and this will culminate in the 31st of October with the Moose Feast.” While the traditions are changing in terms of the technology, and the use of dogs and trucks, what remains is the communal aspect of the hunt and the feast – the bringing in of the younger generation to communal aspects of village life: learning about nature and the forests, a sense of place and connection with the land. These ideas would come up again and again during our week, and I suspect they will be consistent refrains throughout our stay in Selkie. On Monday morning, we were greeted by a few inches of fresh snow. We followed Tero to a small river where a professor and two students, Ilkka and Joose, were waiting by a hunter’s shelter, warming themselves by a fire. Tarmo, the professor, has been instrumental in providing 3rd party samples from the wetlands and forest streams in the catchment area. Tarmo gave a quick interview about his and the University student’s role in the sampling and then we all ventured into the bush to collect water samples. OPOE followed along through the snow with Tarmo and the students as they searched for a spot to test the water. Using maps and GPS, it took about an hour to get to the exact spot they needed. Along the way, Tarmo talked further about his role in the project and its importance for the health of both the forest and the community. He also gave OPOE some context for the vastness of Finland’s forests and wetlands. “Do you know that our area of our mother country is 34 million hectares,” Tarmo said. “And 11 million hectares…so one-third,” is wetlands. He continued by explaining that over 6 million, more than 50 percent of the country’s wetlands have been channeled and drained. The water is removed and the land used for forestries, peat production and farming. He continued, “tens of thousands of people died for hunger only 150 years ago. 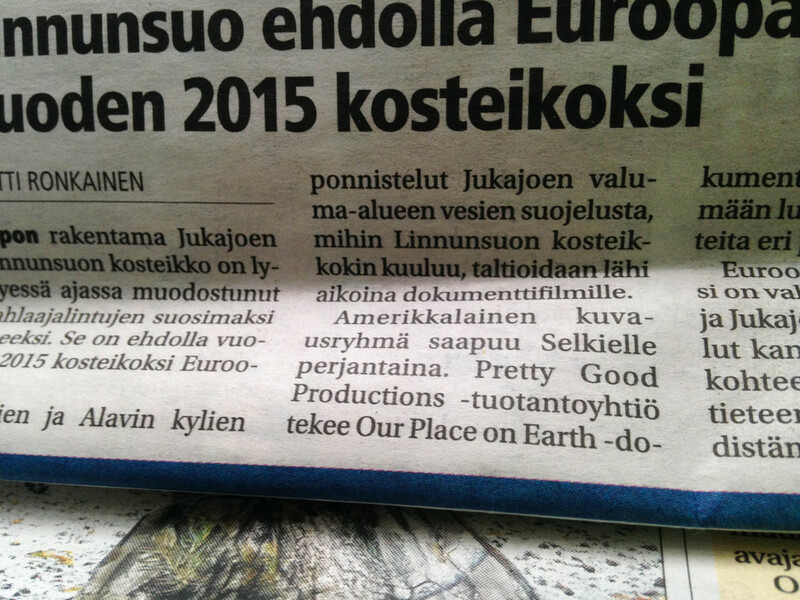 And of course, it’s been the question of life to get more farmland.” But, as Tarmo went on to explain, Finland is now part of the EU. They have a high standard of living and no longer need the vast farmlands of old. 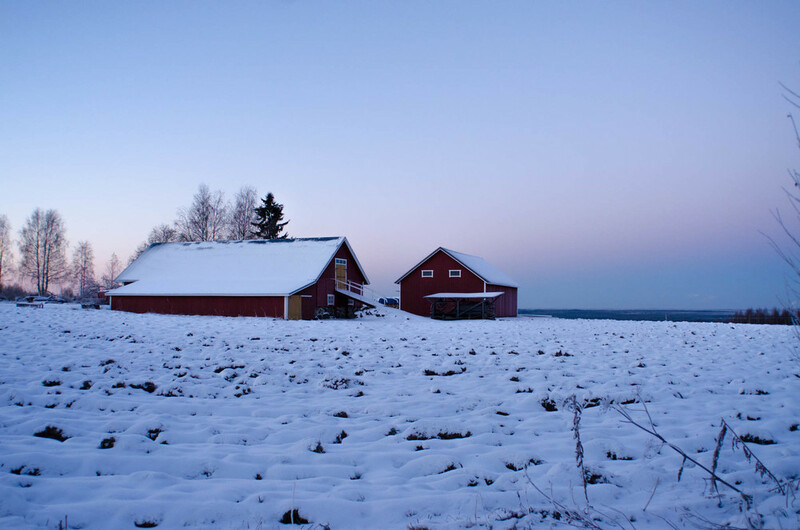 The time has come for a change of land practice in Finland. On Tuesday, we attended a seminar on ‘Village Well-Being’ in a village about 30 minutes from Selkie. It was a good chance to see how the villages work together and to observe discussions on health, safety, village events and communal activities, and other key parts of life in Northern Karelia. Tero moderated the event and community members took turns making presentations about different programs they were running in their villages. Lunch was a delicious homemade fish stew, with dark rye bread, butter, and cheese. Coffee was served with a delicious cake with a pour-over custard. During the event, Kaisu, Tero’s wife, provided us with simultaneous translation so we were able to keep up with the day’s events. 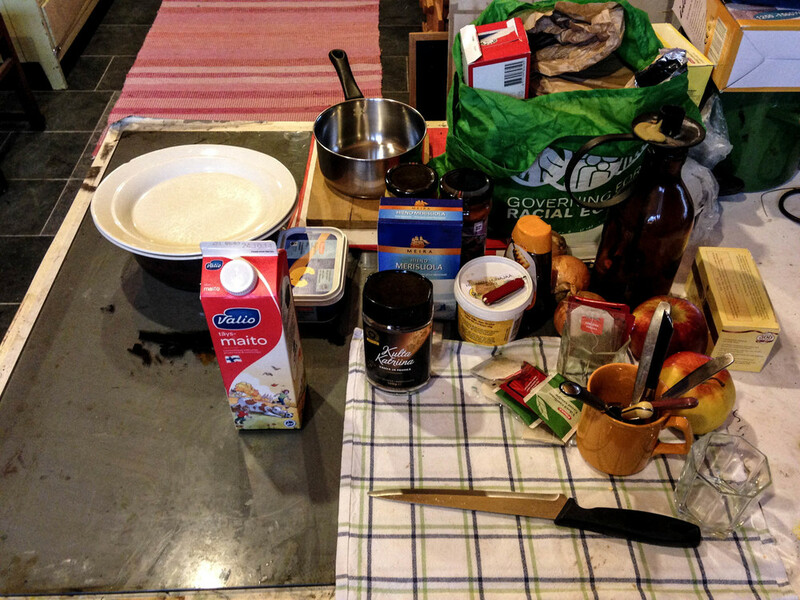 On Wednesday morning, we met at Tero’s house for coffee and to meet our intern and sound woman, S­oile. Soile will be joining OPOE until the 31st of October to help film some behind-the-scenes, and to record audio. After introductions, Tero spent some time coordinating interviews with village members, then we headed off to the forest near Tero’s house – a lot of about 44 hectares of transitional and old growth forest, and valuable intact habitat. 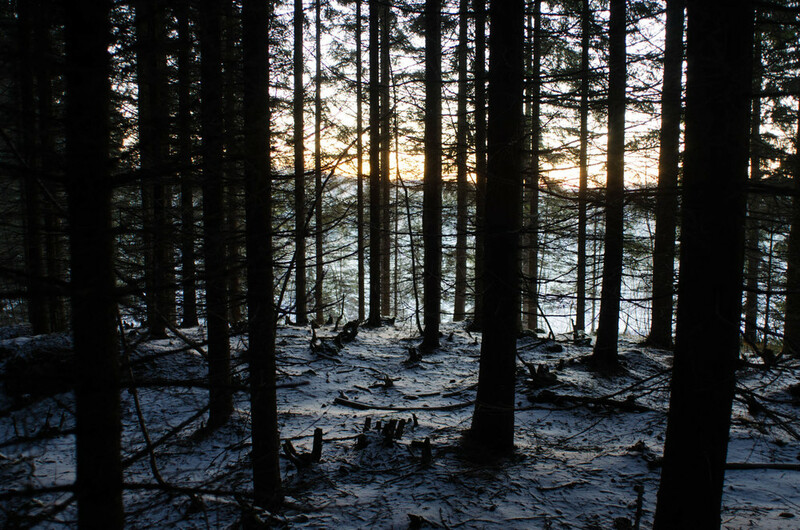 We hiked through the snow for about an hour and Tero gave us a general tour of the forest. In the afternoon, we had tea and visited at Selkie village members Hannu and Päivi's house, then in the evening interviewed a young hunter, Marko. Marko talked at length about life in Selkie, his life as a hunter and trapper and the changes he’s seen in the climate and with hunting and fishing since he was young. Tero’s wife, Kaisu, again came along to help with interpretation. On Thursday morning, we met with Pekka, one of the village’s finest hunters. We met him at his house, converted from his family’s old village market. Surrounded by antiques and regional collectibles, Pekka talk slowly and quietly about life in the village, coming to Selkie with his family in the mid 1960s, hunting, fishing, and the importance of the river to village life. After filming with Pekka, Tero took us to the delta of the Jukajoki river, where we were lucky enough to hear the river singing. We also saw Pekka’s hunting and fishing cabin, and Tero’s handmade boat which we helped drag up and turn over for the winter. We returned home for lunch and then Soile and I went back to the delta to film with the quadcopter. After 15 minutes, I crashed the copter into a tree, breaking 2 blades, and that was that. Back at home, Soile helped me get onto the Finnish internet and order some new blades from Helsinki which are due early next week. (Thanks Soile!) Late that evening, we filmed an interview with Heikki Roivas, a hunter and Selkie villager. Friday was a great way to wind down the week. In the morning, we traveled with Tero to see the Vehkasuo marshmire (see beginning of this blog) and then on to meet a very friendly reporter who interviewed us - standing out in the cold! - about our project and travels thusfar (article due out next week). From there, half frozen from the morning’s work, we headed on to the village of Alavi for an interview with Heikki, a local fisherman, and Kalevi, also a fisherman and hunter, and former head of the village of Alavi. At Alavi’s house, set near an ice covered lake, we were invited in from the cold into a small hut. Inside was a little bit of heaven: a large fire, hot coffee, a lunch of smoked fish, locally foraged mushroom, egg spread, pastries, cookies, and hot berry cider. Heikki and Kalevi had great energy and were enthusiastic, funny, and gracious hosts – not to mention great on camera, delivering stories and meaningful examples of the collaborative work between the villages and the importance of the river restoration project for the villages and for Finland as a whole. 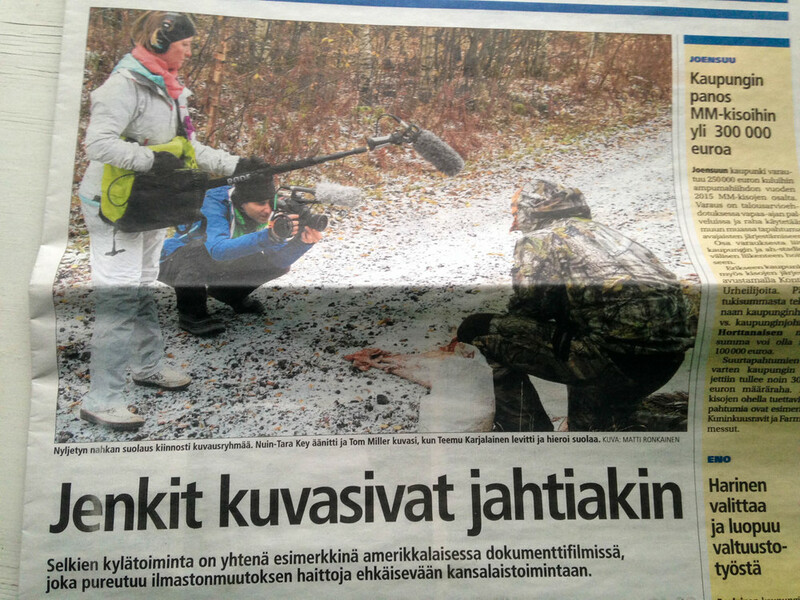 Friday was all that a documentary film crew could hope for: great project context and scenery with Tero on the Vehkasuo marshmire; good press coverage of our project with the journalist; and great food, company, coffee, and encapsulation of a week’s worth of filming with Heikki and Kalevi. Perfect. Saturday. This morning, we took a drive into Joensuu, the capital of North Karelia, to the public library to write this blog and use the internet. It is now raining and the week is looking a bit warmer. The snow will probably vanish and a new side to Selkie will appear. And tomorrow we’re on the lake.